Prominent gables with decorative brackets meet arched windows and an angled garage in this elaborate hillside walkout design. A large kitchen island overlooks the great room while the dining room extends to the rear for exceptional views. The screened porch enjoys a fireplace and skylights top the rear porch. The master suite and a study are upstairs, and two bedrooms and a rec room are on the basement level. 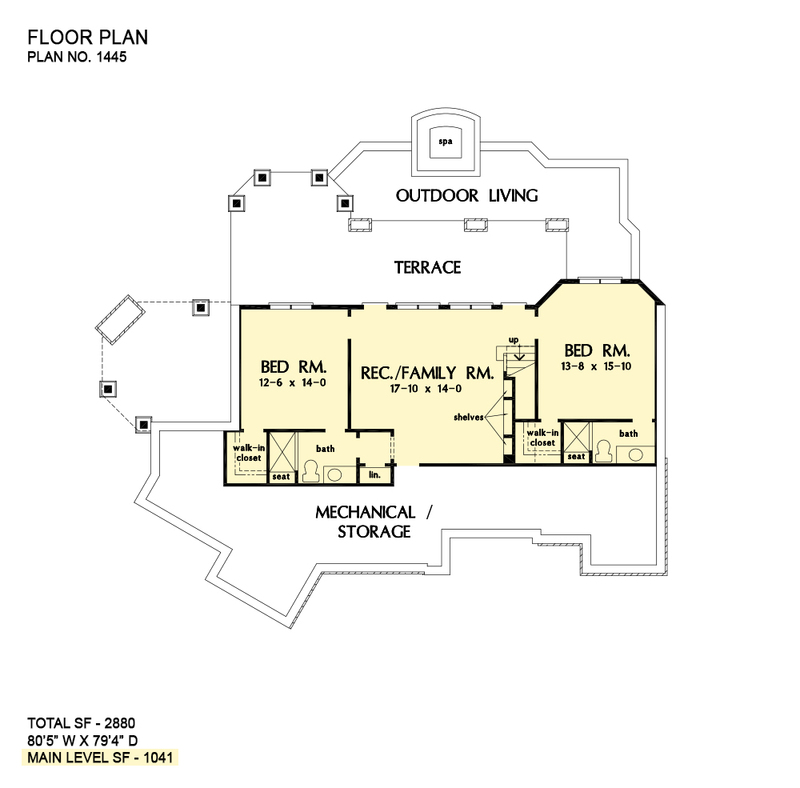 1st Floor: 1839 Sq. Ft.
Porch - Rear: 246 Sq. Ft.
Porch - Screened: 204 Sq. Ft.
Porch - Rear Lower: 449 Sq. Ft. 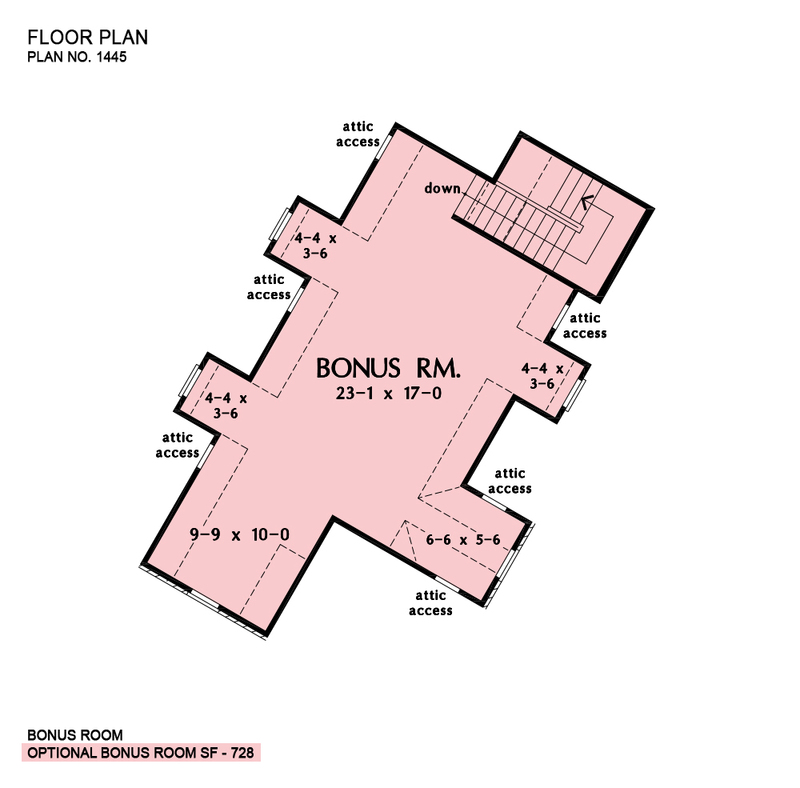 Bonus Room: 728 Sq. 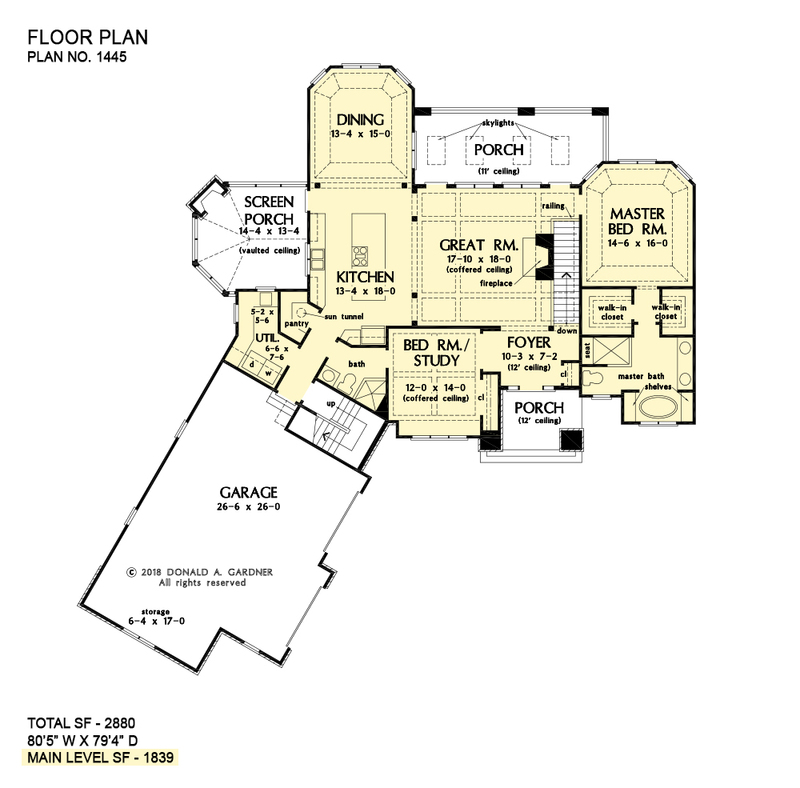 Ft.
House Dimensions: 80' 5" x 79' 4"
Great Room: 17' 10" x 18' 0"
Master Bedroom: 14' 6" x 16' 0"
Rec Room (Flat): 17' 10" x 14' 0" x 9' 5"
Porch - Rear Lower (Flat): 39' 2" x 9' 10" x 9' 10"
Patio - Lower (None): 35' 1" x 9' 2" x 0' 0"
Foyer (Flat): 10' 3" x 7' 2" x 12' 0"
Dining Room (Tray): 13' 4" x 15' 0" x 11' 0"
Great Room (Coffered): 17' 10" x 18' 0" x 12' 0"
Kitchen (Flat): 13' 4" x 18' 0" x 9' 0"
Utility Room (Flat): 6' 6" x 7' 6" x 9' 0"
Bonus Room (Clipped): 23' 1" x 17' 0" x 8' 0"
Garage (Flat): 26' 6" x 26' 0" x 0' 0"
Garage Storage Bay (Flat): 6' 4" x 17' 0" x 0' 0"
Master Bedroom (Tray): 14' 6" x 16' 0" x 11' 0"
Bedroom / Study (Coffered): 12' 0" x 14' 0" x 10' 0"
Bedroom #3 (Flat): 13' 8" x 15' 10" x 9' 5"
Bedroom #4 (Flat): 12' 6" x 14' 0" x 9' 5"
Porch - Front (Flat): 10' 7" x 7' 10" x 12' 0"
Porch - Rear (Flat): 25' 4" x 10' 0" x 11' 0"
Porch - Screen (Vaulted): 14' 4" x 13' 4" x 15' 11"